WREN-FM was a six-month project that simulcasted WREN. KCKN-FM briefly appeared on 106.7 mHz in 1950. KCKN-FM signed on 94.1 mHz on October 1, 1962, under the Continental Stations umbrella. This is one of the longest-running country music FM stations. KCKN-FM mostly simulcasted 1340 KCKN. As the rules on simulcasting changed, the simulcasting gradually decreased. Kaye-Smith Radio bought the station in 1965. The station upgraded from 20,000 watts to 100,000 watts in 1973. 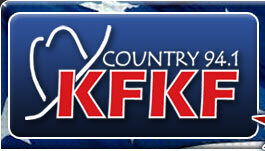 1982-current - KFKF - Country - "94 KFKF"
The call letters were eventually split (it happened to many combos in the 1980s). The KFKF call letters debuted January 17, 1982, under Albritton's ownership. KFKF became the powerhouse, and AM 1340 moved on to other formats. Sconnix bought the station on October 15, 1983. EZ Communications took over in 1995, then American Radio Systems in 1997 and Infinity in 1998. Wilks Broadcasting bought the station in late 2006. They took control through an LMA almost immediately, cutting several longtime employees. KFKF picked up the tradition of shelving its primary format in favor of Christmas music in 2012, typically starting on Thanksgiving. With constant country competition, even within its ownership group, KFKF has always been steady, but never truly dominant in the ratings. In 1978, for example, KCKN-FM placed tenth. In 1985, KFKF placed eighth. But in 1991, KFKF had risen to second place behind WDAF. In 2011, KFKF placed in the top ten, but behind sister station KBEQ. In 2013, just past its 50th year in the format, KFKF zoomed to the top of the ratings. Pittsburgh-based Steel City Media bought the station in 2014.